For marketing professionals and any business with an online presence, staying on top of the latest trends in search engine optimization (SEO) is essential to attracting customers, promoting brand awareness, and ultimately boosting revenue. However, considering that Google’s mysterious search algorithms change frequently, the process of identifying and implementing winning SEO strategies can be daunting. Enrich your site structure and content. Adding more pages full of quality content to your website not only creates additional keyword opportunities, but also provides value for visitors and contributes to a positive user experience—a factor that is being increasingly rewarded by search engines. According to Matthew Capala, a presenter at Digital Summit and the founder of search marketing and optimization agency Alphametic, small businesses and newer websites should aim to have at least 20 landing pages and 50 blog posts on their sites in order to start seeing SEO results. One powerful way to boost your ranking in search results is to enrich the site with more “category pages” based on your users’ most common search queries. Keyword research tools such as answerthepublic.com offer insight into topics that users search for in relation to a keyword; these results can be used to create category pages for your site. In addition, crafting “industry guides” that provide an in-depth explanation of a broader, commonly searched topic is an effective strategy, particularly for business-to-business (B2B) organizations. To ensure an intuitive experience for users, organize your site into logical categories and sub-categories, such as by service, type of product, industries, and local markets that you serve. When crafting the pages, keep in mind that Google prefers long-form content—the average length of content ranking on the first page of Google is 1,890 words! 2. Abide by Google’s search quality rating guidelines. This means that well-researched, well-written content from a credible source will rank higher. When creating content for your site, there are several steps you can take in order to achieve better search quality ratings. For example, include links to authoritative sources (such as major news publications and .gov or .edu pages), highlight your credentials, include customer testimonials, and strive to establish yourself and your business as an authority or “thought leader” in your field. Regularly posting blogs on your site helps improve SEO by driving traffic to the site and positioning it as an informational resource for your customers’ questions. According to HubSpot, companies that blog enjoy 55 percent more traffic than those that do not. When writing blogs, focus on creating outstanding content that answers questions, solves problems, and otherwise creates value for your audience. Center the blog around one or two long-tail keywords, which are keyword phrases of at least three words that tend to be more specific than single keywords. Since search engines are increasingly penalizing “keyword stuffing,” incorporate these long-tail keywords in a way that sounds natural and unforced. Another strategy to help ensure that your blogs effectively boost SEO is to include internal links to other pages on your site, such as related blog posts and pages, when appropriate. In addition to keeping visitors on your site, internal links indicate to search engines that your content is relevant and valid. Google’s free Search Console tool offers a wealth of information about what your target customers are searching for and potential keywords that you may be overlooking. Review page-level data in Search Console, sort keywords by impression, and pay attention to keywords ranking in positions 10-30. Mr. Capala of Alphametic refers to these as your “keyword sleepers” and suggests crafting landing pages and blog posts based on them. 5. Optimize content for Google’s featured snippets. Featured snippets are the selected search results that appear in a box at the top of the first page of Google results, directly below ads. They are intended to provide an answer to a user’s question immediately, and typically include a summary of the answer and a link to a website where more information can be found. Because featured snippets are displayed so prominently in search results, companies that are able to have content from their sites appear in these snippets will experience a significant boost to SEO. One technique that may help companies have their content show up in featured snippets is to think beyond keywords and focus on topics semantically related to their keywords. Tools such as answerthepublic.com and keywordresearch.io can help you discover these related topics and “question keywords” that reflect your target customers’ most common search queries. Then, use these keywords in blogs and headers on your site, and create landing pages highlighting frequently asked questions centered on your question keywords. When incorporating the keywords, focus on likely user intent and provide searchers with the answers that you think they are hoping to find. 6. Optimize for mobile-first indexing. In March 2018, Google began primarily using the mobile versions of web pages for indexing and ranking purposes—a process known as mobile-first indexing. While an index with both desktop and mobile versions of a site still exists, it is now essential for businesses to ensure that their websites load quickly and are viewed easily on a mobile device. One pitfall to avoid is “intrusive interstitials,” or pop-ups that block the majority of content on a page, which can be particularly problematic on the smaller screen of mobile devices. Google has been increasingly penalizing sites with these pop-ups, as they negatively impact the user experience. 7. Create a future-proof SEO strategy that accounts for emerging technology. The speed at which a page loads appears to significantly influence voice search SEO. Google is preferring short, concise answers to voice search queries; the average voice search result is 29 words. Because people speak differently than they write, content with a simpler, more conversational tone is more likely to show up in voice search results. 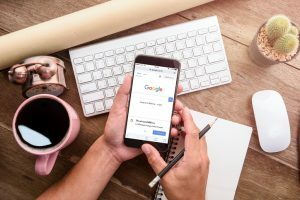 For local businesses, Google often sources information from Google My Business listings—and mobile voice searches are three times more likely to be locally based than text searches! Therefore, ensure that your Google My Business listing is up to date and all possible fields are filled out with valuable content. As SEO best practices continue to evolve, staying on top of the latest changes to Google’s algorithms and trends in internet user behavior is the key to a winning SEO strategy. Need to optimize your website’s SEO for 2019? Contact LuCorp Marketing today to schedule a free consultation! (Sources: https://www.searchenginejournal.com/seo-trends/281053/#close, https://blog.hubspot.com/marketing/blog-search-engine-optimization, https://searchengineland.com/5-seo-trends-that-will-matter-most-in-2019-307641, “SEO Quick Wins: 20% of Actions for 80% of Results, presentation by Matthew Capala of https://alphametic.com/ at Digital Summit Phoenix 2019, “SEO Special Report: The CMO’s Guide to SEO in 2019” https://alphametic.com/seo-report).